Several cities are vying to replace London as Europe's financial capital post-Brexit. What will make banks leave, and what will make banks stay? A commentary by the Professor of Banking and Finance at City University of London. The outcome of the Brexit referendum on 23 June 2016 has raised many questions, including the evaluation of the ex-ante costs to the UK, the negotiation of new trade agreements, and the implications of reducing freedom of movement in the UK labour market. Yet, one of the most talked about issues relates to the potential threats to the financial services industry and the City. While there are many views and tentative assessments of the economic impact of Brexit on the UK financial industry, the uncertainty is substantial. 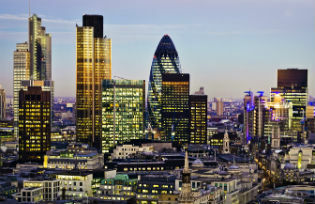 The financial services industry, including banking, insurance, asset management and ancillary activities, is one of the UK’s main industries. According to government estimates, as per the end of 2014, the UK financial sector contributed £126.9 billion in gross value added (GVA) to the UK economy, or 8.0% of total value added. The financial services sector employs 1.1-1.3 million people, representing around 4% of the UK’s total workforce. In addition, in 2013-2014, the financial services sector accounted for 11.5% of total government receipts according to the Office for National Statistics. While estimates vary, it is clear that the financial services industry makes a very substantial contribution to the UK economy. The reasons behind the success of the UK financial services industry are manifold: the legal system, the English language, and the labour market (including the ability to attract international talent). However, EU membership also played a key role in fostering the growth of the City. Through freedom of movement, the industry attracts highly skilled EU nationals. And, more directly, EU membership grants the so-called “passporting rights” to UK banks. Since the passing of the First Banking Co-ordination Directive in 1977, EU legislation has been directed towards creating an integrated and competitive European banking system. Possibly the most far reaching legislation for EU banking, the 1989 Second Banking Co-ordination Directive, sought to enhance competition by establishing EU-wide recognition of single banking licences (or ‘passports’). In simple terms, passporting rights enable banks established in any EU country – either EU owned or EU subsidiaries of foreign banks – to establish branches or carry out cross-border activity in the rest of the EU and in EEA countries. In addition, to reduce the regulatory burden and facilitate cross-border activities, equivalence provisions have been included in most of the EU’s recent financial services acts. The principle of equivalence relates to the recognition of a foreign (third country) framework in regulation and supervision, particularly with respect to cross-border provisions. This recognition makes it possible for authorities in the EU to rely on supervised entities’ compliance with the equivalent foreign framework. The technical assessments of equivalence are carried out by the European Commission (EC), based on technical advice from the relevant European authorities (EBA, ESMA and EIOPA). If UK banks were to lose passporting rights as a result of the Brexit negotiations, this might entail substantial restructuring particularly in terms of their business models. One commonly made assumption is that, post Brexit, UK banks would either retain passporting rights (through some sector specific deal) or benefit from full equivalence. In this case, the assumption is that the EU will recognise the UK regulatory regime as equivalent to the corresponding EU framework, as UK financial firms’ starting point would be the current EU regulatory framework. However, uncertainty remains with regards to the range of services covered by the equivalence regimes: these are more limited compared to the existing passporting rights and can potentially be withdrawn at any time if a country deviates materially from EU standards. The key question is: how disruptive would a change from passporting rights to an equivalence regime be? The answer depends on the results of the negotiations and, for now, we do not have a blueprint for what the initial negotiation position will be. Any forecast at this stage would be highly speculative. Nonetheless, we can start by making a few assumptions. Most financial service provision in the UK is directed at the domestic economy. Recent estimates from Oliver Wyman put this figure to 50%: of the £200 billions of annual revenues, around £90-£95 billion is generated by domestic business. The remaining 50% of generated revenues is split almost equally between EU and non-EU (‘rest of the world’, or RoW), corresponding to around £50 billion in revenues. While these figures alone are not trivial, it needs pointing out that the level of interconnectedness in the financial system means that the effects of any Brexit agreement are likely to extend beyond business done directly with EU clients. Contingency plans might require banks to set up subsidiaries in EU countries. This, however, is dependent on the type of business carried out with EU clients and whether a restructuring of the organisation would prove optimal in the long run. For UK-based banks, this might be a possibility and the largest UK banks already have several EU subsidiaries. However, third country financial institutions might not have the necessary scale to operate in both the UK and in the EU, and might therefore exit the UK market altogether. It is in this context that large American banks have started considering moving jobs and assets to the EU. For example, Citigroup is said to be considering moving its equity and interest rate derivatives traders to Frankfurt. Similarly, JPMorgan and Morgan Stanley have said they will move jobs from London to the EU if the UK loses passporting rights. Russian state-controlled VTB bank is also considering Frankfurt as an alternative location to London. For RoW banks, moving staff out of London might be disruptive, but it will be weighed against the benefits of retaining EU business. International banks are unlikely to uproot all their London operations, but they will certainly move those parts that will benefit most from remaining in the single market. This, in turn, might lead to a decrease of the gravitational pull of the City of London as one of the world’s major financial centres. London’s competitive advantage might decrease. Indeed, other European cities are already vying for financial sector’s jobs. That London’s position will survive unscathed post-Brexit is, in my view, wishful thinking. Assessing the size of the potential damage is more difficult and will depend on the type of Brexit negotiated by the UK government and on the outcome and length of the negotiations. While London will almost certainly become less attractive, there is no obvious contender to the role of ‘Europe’s investment banker’. While Frankfurt might be positioning itself to take the lion’s share of the business planning to leave London, other cities including Paris, Dublin, Luxembourg and Milan are also hoping to attract financial institutions seeking to remain within the EU single market. The problem with Frankfurt and other EU cities has always been domestic labour regulation, particularly in Germany and France. Cost of living and lifestyle are also important factors. Few cities can offer the same lifestyle as London, at least at present. However, depending on the type of Brexit, immigration controls might make it difficult to hire non-UK staff and EU citizens might lose the right to work in the UK. The ease with which they are able to move employees has always been especially important for global banks and it might drive jobs out of London. European economies will also be disrupted by declining access to the City of London post-Brexit, since UK banks supply over half of debt and equity issuance to continental firms and account for over three-quarters of foreign exchange and derivatives activity in the EU. It is undoubtedly a lose-lose situation. Every economic sector, both in the UK and in the EU, will be adversely affected. While there could be some small gain for some EU countries (France, Germany, Italy), the possible fragmentation of business could be detrimental to the EU as well as to the UK. Looking at Brexit from a European perspective, reconciling the (possibly conflicting) interests of the EU27 countries and the diversity of views will be difficult, and will likely impact substantially on the type of deal ultimately negotiated. Some would argue that an eventual reduction of London’s gravitational pull post-Brexit would a positive outcome for the UK economy. In the aforementioned 2015 study, the UK government’s stated aim is to rebalance the UK’s economy across sectors and regions, away from an over reliance on the financial industry and London and the southeast. While these objectives would support the UK economy overall, including a stronger focus on regional growth, the outcome is far from certain and will require both a robust industrial policy and sustained government intervention, neither of which can be guaranteed. Barbara Casu Lukac is Professor of Banking and Finance and Director of the Centre for Banking Research at the Cass Business School, City University of London.